A little help Iding a Cortibert pocket watch? The Steampunk Forum at Brass Goggles > General Steampunk > Tactile > Chronautomata (Moderator: von Corax) > A little help Iding a Cortibert pocket watch? I traded with another Steampunk maker earlier this week and ended up with two pocket watches that are currently ticking along nicely. A Westclox scotty minus the crystal that's a fairly common working mans watch sold through sears roebuck catalog. The Cortibert that I'm having difficulties researching, the watch face has an amber hue with roman numerals colored gold/metallic at 3,9 and 12. The 60 graduations are black with every 5th marked metallic gold. the bottony cross is not present on the watch face. I suspect its of newer manufacture, but the case may have been replaced at one point. It will likely be a few days before I open the case for a picture of the mechanism, it appears a well loved piece. With any luck I can upload an image or two this evening of the face, its not really photographing well. From what I have found the Cortibert company started making parts and pieces in 1790 and started producing watches in 1880 and closed its doors in 1970s. Producing a lot of different models isn't really helping narrow down the ID. 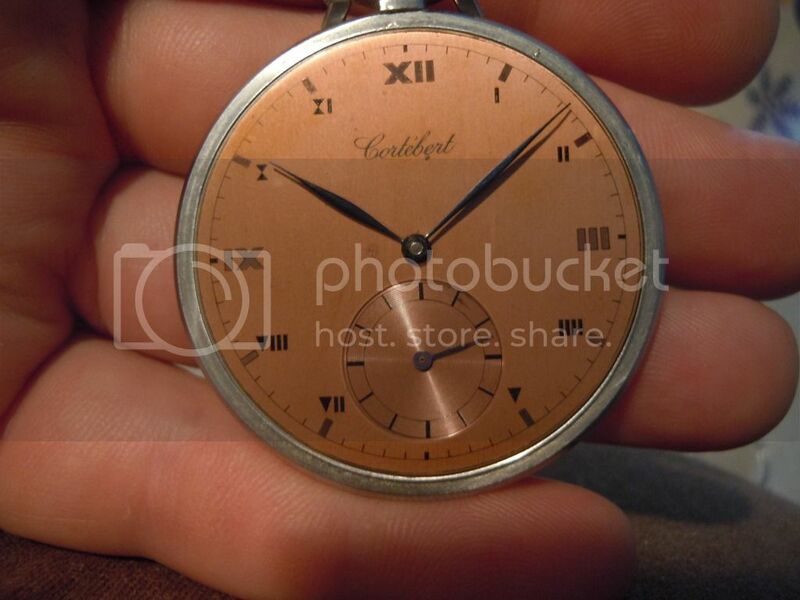 Re: A little help Iding a Cortibert pocket watch? Try searching for Cortébert, instead of Cortibert. opened the case and its a 620R swiss made apparently started around 1945. The crystal appears to be plastic, case nickel chrome with a few nicks and scratches. After three days it appears to be keeping fairly good time. Not sure about the 1470332 6518 engraved on the inside of the case, the numbers are not helping me find any information. 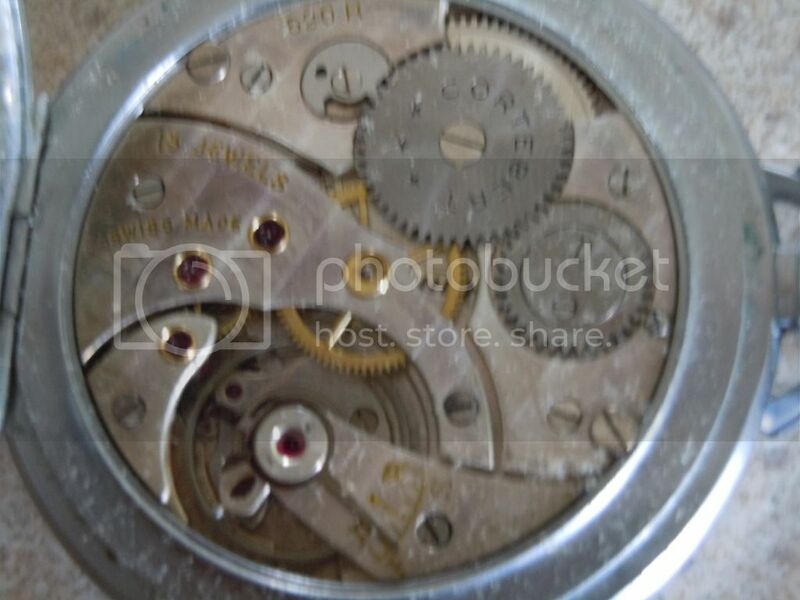 movement picture is a little blurry, and yes I cleaned up the watch with a cotton swab before putting it back together. You may have a bit of luck asking for info on Homageforum.com, there are a few experts there regading this great maker. Just make sure you do an intro and look around a bit, too, then ask away. They're usually a friendly bunch.